We truly need an independent press right now -- so we have to put our money where our mouths are. 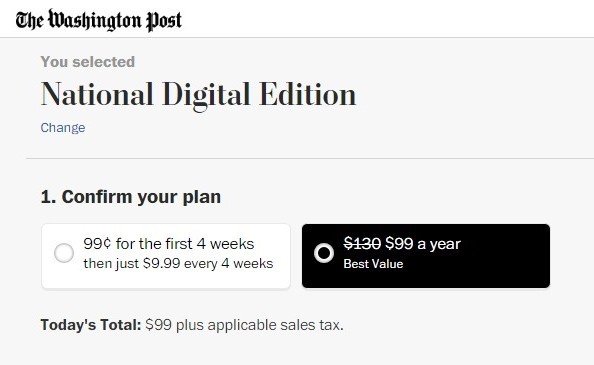 I was so moved by the Washington Post's role in uncovering former national security adviser, Mike Flynn's treachery and forcing his resignation that I finally got past my childish feeling that I should not have to pay for quality reporting and subscribed to the WaPo yesterday. $100 bucks a year is a tiny price to pay for the preservation of our democracy! I urge you to join me in subscribing - here's the link. I also made a donation to the New York Times (I already have a subscription to that via a family member). You should either subscribe or make a donation, too. And I made a donation to the Guardian not long after the election because I think they do excellent reporting. Perhaps you're also a fan of their reporting? 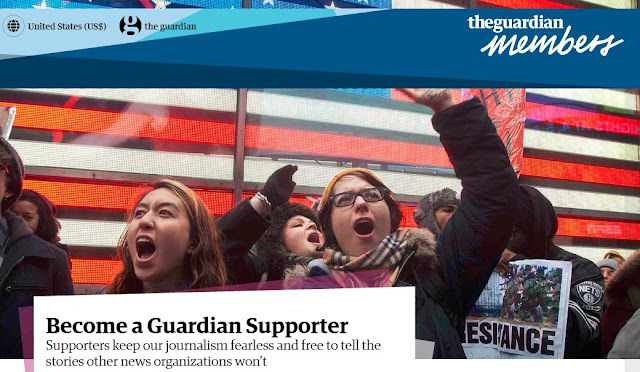 If so, please support the Guardian. Other places to consider supporting include Slate. And Teen Vogue has done some of the best reporting around lately. Feel free to suggest other good sites/papers via comments. Also, if you haven't already done it, please call your members of Congress to urge them to investigate Trump's ties to Russia right now. You can use the scripts in Monday's post or simply say, "I urge Senator/Rep.NAME to investigate President Trump's ties to Russia in the wake of the revelations about Mike Flynn's treachery." And while you're at it, you might as well tell the staffer that you'd like them to demand that Trump release his tax returns. We need to get to the bottom of this sordid affair as quickly as possible and we cannot afford to "move on" from it as some Republicans have requested. If Russia were involved it only served to reveal deep corruption in the DNC, Hillary and the Obama Administration. Is this what you object to that the truth be known, to which Wikileaks is really responsible, or is it because you believe Russia and Putin to be evil super villains? Wouldn't it be far better to have good relations with Russia instead of treating them as the enemy? Also, do you really believe having a conversation with a Russian diplomat about the possibility the Trump Administration lifting sanctions rises to the level of treachery the kinds of things Wikileaks has revealed? Are you comfortable with the reality that Hillary armed ISIS through an authorization of arms to Qatar, who in turn supplied them to Al Qaida and ISIS in Syria? Hillary therefore largely contributed to the wave of terror wrought upon the children and families of Aleppo among other places, and facilitated the mass exodus and displacement of these people she claimed to care so much about. I'm not going to waste my time engaging with trolls here.